Coaxed to swing a racket while still in the crib, forced to hit hundreds of balls a day while still in grade school, Agassi resented the constant pressure even as he drove himself, an inner conflict that would define him. In his beautiful, haunting autobiography, Agassi tells the story of a life framed by conflict. Agassi makes us feel his panic as an undersized seven-year-old, practicing all day under the obsessive gaze of his violent father. We see him at thirteen, banished to a tennis camp. A lonely, scared, ninth-grade dropout, he rebels in ways that will soon make him a 1980s icon. 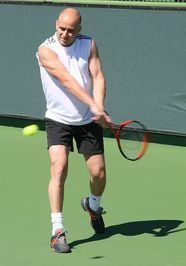 By the time he turns pro at sixteen, his new look promises to change tennis forever, as does his lightning fast return. Yet, despite raw talent, he struggles. We feel his confusion as he loses to the world’s best, his greater confusion as he starts to win. After stumbling in three Grand Slam finals, Agassi shocks the world, and himself, by capturing the 1992 Wimbledon title. Overnight he becomes a fan favourite and a media target. Agassi brings a near-photographic memory to every pivotal match, and every public relationship. Alongside vivid portraits of tennis rivals, Agassi gives unstinting accounts of his relationships. He reveals the depression that shatters his confidence, and the mistake that nearly costs him everything. Finally, he recounts his spectacular resurrection and his march to become the oldest man ever ranked number one. This book provides an honest and indepth insight into Agassi’s world.It is an absorbing read.Here is what others are saying about this book. This book kept me awake at night. I felt compelled to finish it in 2 days (“straight sets” maybe? – not my fault for the metaphor). I might as well add that I was surprised to find out that Agassi fundamentally hates tennis and that he was an underachiever – he could have done (much) better. The way his father forced him to train as a little boy and the life he led as a tennis pro were also very interesting to know. While browsing my next buy, I had stumbled upon this one a number of times, before I finally decided to buy and read it last week. Time and money well spent. So, what is the book about? First, it is not a story of a flawless man or an impeccable athlete. It is one of a confused, rebellious and an ever evolving man in search of himself, who by the way, plays great tennis. Second, it is also not a blow-by-blow account of tennis matches. But, a diary of his love-hate relationship with tennis; where he plays not because he loves tennis but he cannot live with a defeat. It is a narrative of his innermost thoughts process at moments that affected him; and not just the ones on the tennis court. Beautifully written, and brutally honest. After reading the book, I say he is a Phoenix, burning himself down and rising from his own ashes. Well folks…This book sounds cool.Go check it out. This entry was posted in Biography and tagged Andre aggasi, Open on September 27, 2013 by readbook. Andre Kirk Agassi is a retired American professional tennis player and former World No. 1. Generally considered by critics and fellow players to be one of the greatest tennis players of all time, Agassi has been called the best service returner in the history of the game.